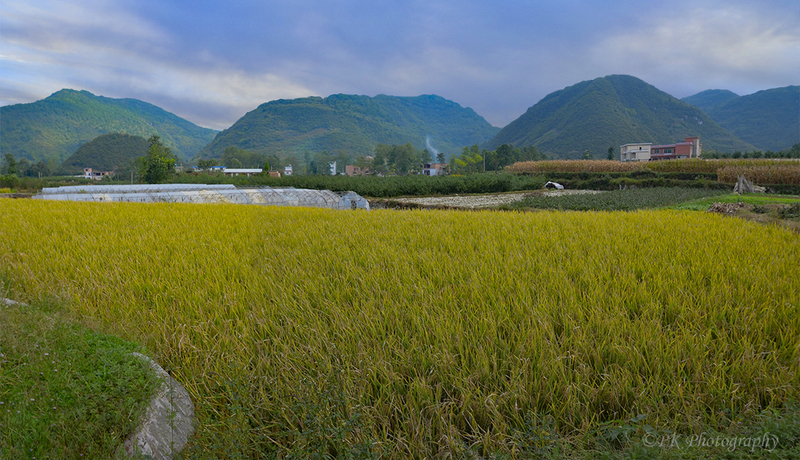 These farms in Guizhou Province, China, are traditional and rural. Our private guide, who took us on hikes from village to village, told us that he played cowboys and indians among the husk stacks as a child. In the distance are traditional rice terraces, but another ubiquitous crop is the red chili pepper, which you can see drying on porches everywhere. Rice is grown in broad fields as well as terraces. These fields will be used for other crops, such as canola, once the rice is harvested. In this quiet valley in rural China, a small house is nestled amid terraced fields and intersecting roads. This is a companion image to my last post, also from rural China. It is a quiet scene, but there is a lot to see. There is a pump house on an irrigation pond, harvested fields with stacks of rice stalks, and a few of the ubiquitous Chinese electricity wires. If you look closely, you can see a dog sitting on the pump house porch. Our guide told us that when he was a child he loved to play cowboys and indians among the rice stacks and he showed us how to make them. As for the wires, in this image I believe they are not a blight but a touch of country charm. Happy New Year! I am glad to be back to my blog after a recent week-long trip to Death Valley National Park and then some enjoyable holiday activities. I will post some images from the trip soon, but today I would like to show you a rural landscape scene that I shot while traveling in China. It is fascinating to see how any available space, whether flat or mountainous, is used to cultivate rice. We hiked through some rice terraces and I became very serious about my footing after our guide told us that he had once fallen from a terrace down to the next level. Fortunately, he was rescued by some farmers and recovered from his injuries.